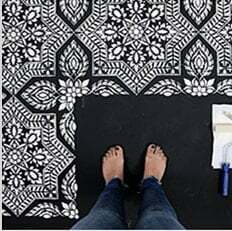 Mural Stencils: Elegant wall mural stencils and Fresco stencil designs by Cutting Edge Stencils. Murals are back in style! Everyone is getting tired of minimalist trend, and so we welcome back the lush maximalistic murals and frescoes! Just look at the results you can achieve with these amazing Mural stencils. It just goes to show that you don't have to be a classically trained artist to produce stunning murals and frescoes. Stenciled Fresco stenciled murals look great inside panels in a dining room, or on a wall in a bathroom, on tray ceilings and in kitchens. By using our mural stencils you can dramatically increase the speed of your wall mural project. Create wonderful landscape murals with ease by blocking in your elements with a stencil and then adding shading with a stencil brush. Grisaille murals are some of the most elegant wall decorating treatments. Classy and timeless, a grisaille mural adds sophistication to any room. Please watch our How To Stencil Videos to learn this beautiful mural stenciling technique.